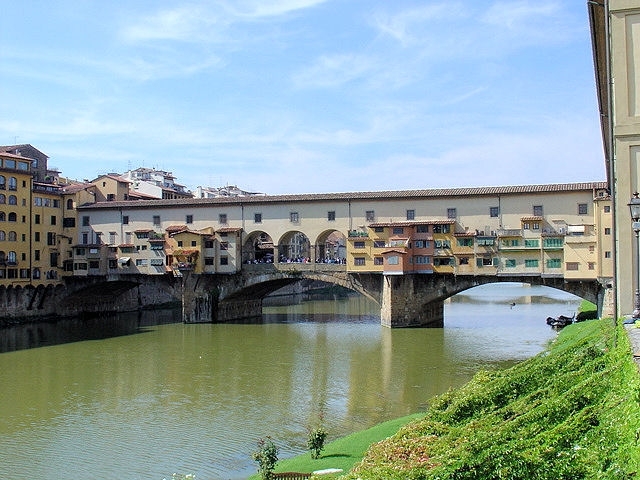 Completed in 1345, the Ponte Vecchio or "Old Bridge" is truly one of Florence's greatest treasures. Not only is it one of the most visited places in Florence because of its treasure of gold and silver merchants, it's the only medieval bridge to survive WWII because of its historical significance. Once home to butchers, tanners and blacksmiths who used the river as their waste disposal and were later evicted in 1593, the bridge welcomed gold and silver smiths who continue to live and operate quaint little shops along this "treasured" landmark. 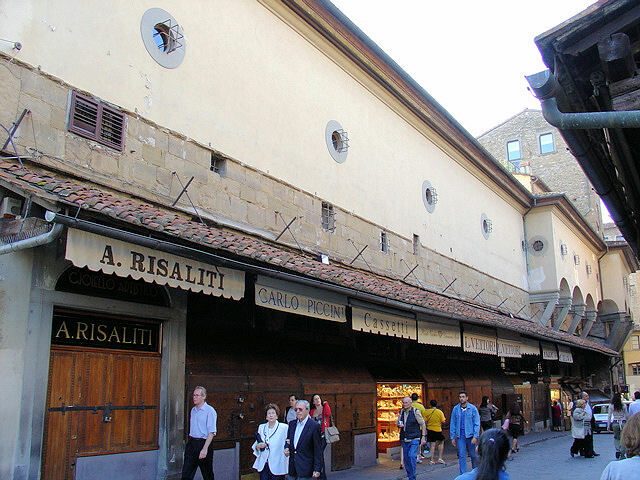 If you look closely in the photo below, you will see for yourself that many of these shops are actually cantilevered over the River Arno and supported only by wooden beams called "sporti." It's quite remarkable to see in person. Below is a shot of the interior of the bridge at the midsection. Further down, the bridge reveals its treasures of gold and silver. Near closing time on the Ponte Vecchio! At the midway point along the bridge, if you look out over the River Arno and to the left, you will the exterior of the Uffizi Museum, another of Florence's greatest treasures. In 1565, Cosimo I de Medici ordered the construction of the "Vasari Corridor," a corridor that extends from the Uffizi Museum, across the Ponte Vecchio and culminates at the Pitti Palace in Oltrarno, the other side of the river. Catherine de Medici used to pull herself along a railing along the corridor in her later years. This "hidden" passageway closed to the public when I was there, is now open for public tours and I urge you to take advantage of the historic journey. 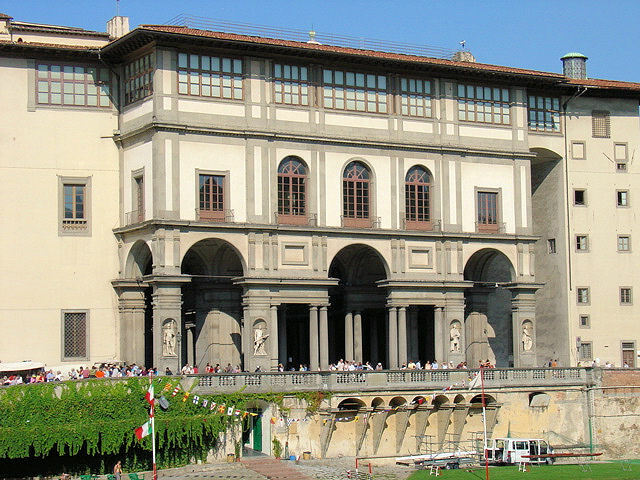 Look carefully at the photos above of the interior or exterior of the bridge and you will see windows or little portals into the Vasari Corridor. 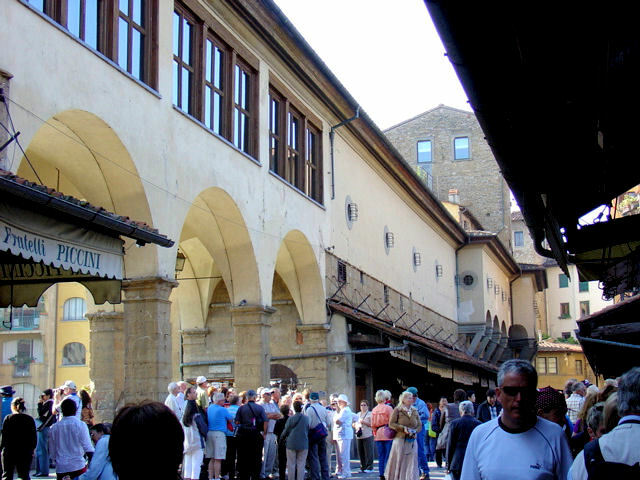 You can book a tour of the Uffizi Museum and the Vasari Corridor via Viator. Check it out. 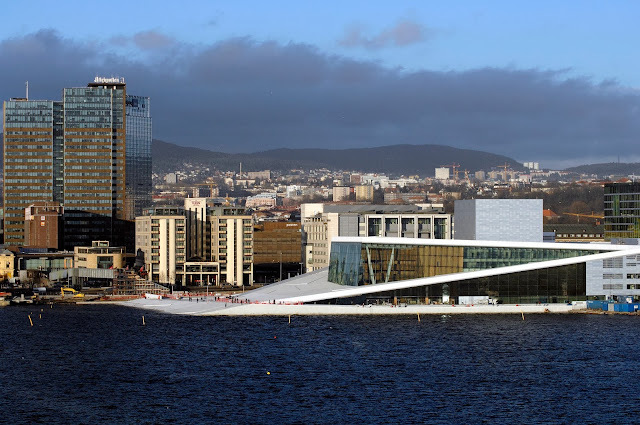 Wow-- that is one cool bridge! Love the shops-- I can't imagine how those stay up. It's truly incredible and indeed memorable! Quaint little shops brimming with treasures. Step to the back of some of them for outstanding views of the Arno River. Thx for stopping by and sharing your thoughts! I really liked the close up of the shops alond the Ponte Vecchio! They look like they are just clinging to the walls. Thanks so much!! I just love this historic old bridge despite the fact I can't afford most of the wares peddled here. If you haven't been, I strongly recommend it!! Some beautiful Pictures! Reminds me of my few weeks I spent in Italy! Thanks so much for the compliments!! I just love this bridge for its picturesque qualities...hard not to take a decent photo! 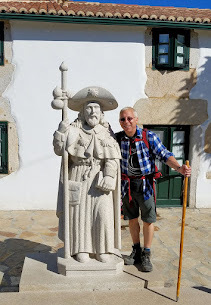 I didn't have quite the same experience at the bridge as you did. I went on a day when cruise ships were docked in Livorno. I imagine the bridge is already busy, but with cruisers there too, it felt congested. Didn't even get a chance to go in the shops because I just wanted to escape the crowds. I need to go back for a more relaxing experience there! Sorry to hear that my friend. I am happy it was not the congested nightmare you described above...for I too would have wanted to escape as fast as possible. 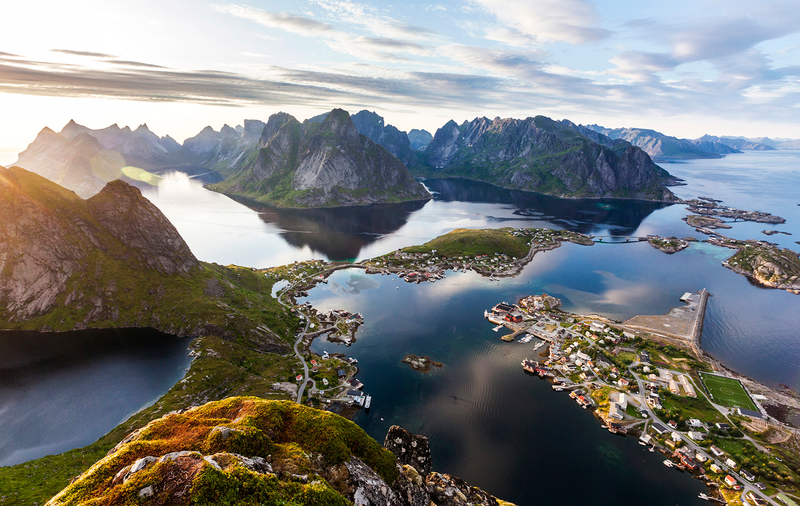 With that said, you must get back and enjoy it at a more leisurely pace, it's definitely worth it. Thanks for stopping by and sharing your thoughts! This place is so enchanting, it's hard not to take a great photograph! Thx Mei, for stopping by and sharing your comments. Great pictures! Ponte Vecchio is one of my favorite in Florence. I love the night walk around there where the light are lit and street musician are performing. Such a beautiful sight. There's actual resort in Las Vegas that built to look like Ponte Veccio. Thank you again Sarah for taking the time to visit and share your experiences. I love this place and all the shops despite the fact I can't afford most of it...still fun to stroll. Wow...did not know about resort in Las Vegas..need to look that one up....Thx again. Great site! I just found you and will follow for sure. I'm a photographer/writer living in the south of France until the end of September. I post something about life here every Friday. Hi there Patricia!! Thank you so much for finding me and for your kind words. I am deeply grateful!! Thanks for including your link...I am going to check it out right now!! Have a fantastic time in the south of France for the rest of the summer. How wonderfully enchanting it must be! Hi there my dear friend from around the world! Thank you for stopping by and for your kind words! I too, fell in love with this bridge the first time I saw it from the Uffizi! 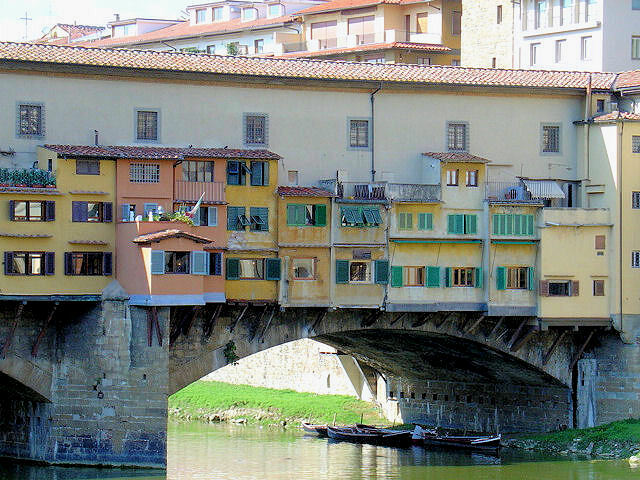 It's amazing that during WWII, the Ponte Vecchio was protected from the bombing! I believe it is the only medieval bridge to have survived.